In the “historic” U.S.-China climate agreement this week, Beijing simply reiterated previously announced targets. The big headline coming out of the second summit between Chinese President Xi Jinping and U.S. President Barack Obama is a climate agreement the two sides reached about cutting carbon emissions in the coming decades. News stories have used sweeping language like the “historic climate change agreement” to describe the deal. This seems to greatly exaggerate the significance of the deal, at least from the perspective of China. In fact, in the agreement Beijing simply reiterates commitments it had previously announced. This is unimpressive compared to the commitments China made, according to the same article. “China’s pledge to reach peak carbon emissions by 2030, if not sooner, is even more remarkable. To reach that goal, Mr. Xi pledged that so-called clean energy sources, like solar power and windmills, would account for 20 percent of China’s total energy production by 2030,” the NYT article stated. Actually, China does not appear to have committed itself to anything new in the agreement. Indeed, following an Obama speech on U.S. climate policy back in June, China outlined its own future emissions policy. Specifically, He Jiankun, chairman of China’s Advisory Committee on Climate Change, told a conference in Beijing that China would set an absolute cap on its CO2 emissions when it released its next five year plan in 2016. He refused, however, to say what that cap would be. To be clear, He later tried to walk back his comments in an interview with the South China Morning Post, stating, “This is still a proposal made by Chinese experts after extensive research, [but is] not yet a government decision.” Still, it would be extremely uncharacteristic for a Chinese official to announce specific targets unless something very close to a decision had already been made. In that sense, the new deal hardly seems less like a landmark agreement and more like China reiterating what it had already announced, while Obama uses Beijing’s commitments as cover to accelerate America’s emissions reductions. 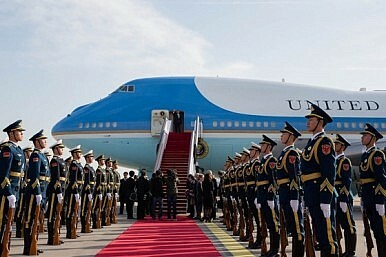 To be fair, however, the New York Times article quoted above did report that the deal was “worked out quietly between the United States and China over nine months and included a letter from Mr. Obama to Mr. Xi proposing a joint approach.” Thus, it is possible (though seemingly unlikely) that negotiations with the U.S. is what spurred Beijing to set these targets in the first place, and the agreement was just reached five months in advance. Still, at the very least, the agreement announced this week provided little new information about China’s climate policy. Progress over climate change depends largely on the actions individual major carbon emitters, particularly China – not U.N. summits. But is the political courage there to exact change?